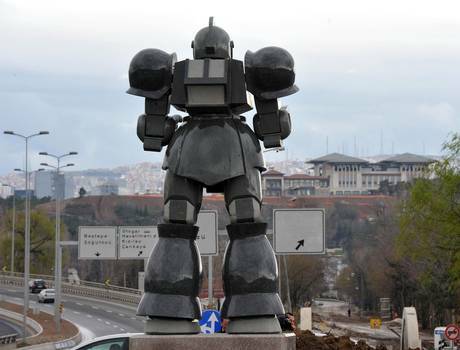 Turkish mayor Melih GÃ¶kÃ§ek is in some hot water over the creation of a Transformers-esque robot statue. 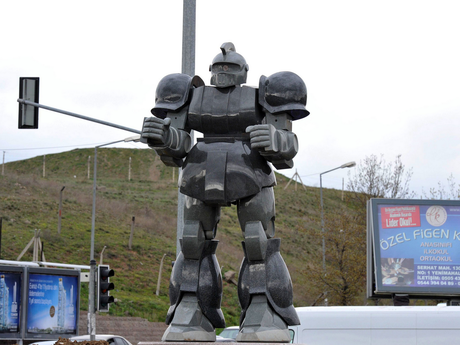 GÃ¶kÃ§ek now has a criminal complaint filed against him by the Turkish Chamber of Architects and Engineers (TMMOB) due to his decision to use public money to create the 6 meter (nearly 20 foot) tall robot statue in the capital of Ankara. The robot itself appears to be a mashup of Transformers characters, but "cannot be named as such due to copyright issues," states The Independent. While it was originally "believed that the statue was an April Fool's joke...bemusement quickly turned to anger when it was revealed how it had been paid for." The robot's main purpose was to promote an upcoming theme park in Ankara, a "prestige project" according to the mayor, while 20 additional metal bots are slated to reside in the completed theme park. Although TMMOB representatives believe the robot to be a "monstrosity" and a waste of taxpayer money, GÃ¶kÃ§ek himself has defended his decision to place a giant robot in Ankara and even requested that people "respect the robot". Do you respect the robot, or do you side with the TMMOB? Now, why can't we get Detroit to do this with Robocop? Looks more like a Zaku from the Gundam series, not Transformers. Looks more like a Zaku from the Gundum series, not Transformers. That was my thought as well, kinda wish my town would do something like that. I respect the robot too. Oh robot overlords, you have finally revealed yourselves to our pitiful existence. Show us the true way! I give myself and whatever offspring/sentient growths I claim ownershop on, unto you. Dr Steel will prepare the others. How much did it cost, and how many lasers does it have? All depends on those two critical questions! That's because it is. There is nothing that even hints at "Transformers" in its design at all. The single eyed head with the Mohawk is clearly Zaku, same with the shoulders. The widened feet and skirting is also heavily "Mobile Suit Gundam" inspired. To answer the question seriously, it all comes down to the deal cut over this amusement park it's intended to help promote. If the deal is done and ground has actually been broken and IF the town agreed as part of the deal to help with promoting the park, then it's fine. Otherwise as much as I think it's cool, I'm also a huge geek, and can objectively say that to a non-geek it does lack dignity. As a general rule public works like this are supposed to be agreed on by the tax payers in the area, in part to ensure at least the majority of people appreciate what is being constructed, and also to ensure that there aren't other concerns being overlooked like having enough money to repair the roads or funnel into the local schools, statues and such are typically the last thing on the agenda for a well governed town. Of course as I said to begin with, if there was a deal cut that the local government was supposed to help promote this development, then this is a reasonable use of the budget as it would have already been covered (even if what was going to be done was not specified) as part of the original deal. To put this into perspective, when I lived in Connecticut I believe it was Mystic (big tourist destination, so it was probably them) decided to do a huge town-wide promotion featuring "Mr. Potato Head" as the famous toy was created there apparently. This promotion involved putting up states of Mr. Potato Head (high grade plastic ones mostly) in various costumes throughout key areas of the town. This all falls under the purview of that particular town because their big schtick is tourism and they have a portion of the budget put aside just to do crap like that to entertain tourists and/or drag people in (Mystic, if I remember the people who did it correctly, also has things like their Seaport, Aquarium, and Olde Mystic Village, not to mention a pizza place famously used as the subject for a movie, it's also strategically located within fairly close distance to some very nice beaches). At any rate this became controversial because some SJWs (this was right before it became a labeled "thing") decided for some alien reason that Mr. Potato Head was racist and all of the Potato head statues were supposed to be racist parodies of black people because they were brown and had exaggerated features (you know, being Potatoes that are supposed to be being decorated with pins or plastic stick in parts resembling facial features). This lead to similar controversies over the use of public money, the statues were pulled stupidly enough if I remember, but not much came of it because the local government had standing permission to do that kind of thing. There is no racial SJW outcry with this robot, but there is a public one, and I guess in the end the big question comes down to what kinds of power had been granted to the person who made that decision and/or what contracts he's operating under. That said the robot looks very "Gundam" like to me as well, I'm almost shocked to see that this is Turkish as opposed to another infamous Chinese knock off. While I expect people to have mixed opinions on a forum like this, it's a sign that I think the first world and it's allies need to start becoming more assertive about global IP violations. I wouldn't think it would be that hard for Turkey to try and come up with some of it's own ideas without basically trying to counterfeit (just different enough to engage in denial) other people's IPs. At the end of the day it doesn't matter if it's Gundam or Transformers, if I was the Japanese IP owner and saw someone making millions at a theme park like this I'd be pissed. This kind of knock off was ignored when China did it, so now your seeing other countries doing the same thing.... of course none of this applies if the deal is cut with the IP holders from Japan. I wouldn't be shocked to learn if at least some of the investors are Chinese though as this does very much seem like their M/O. Isn't that from the Gundam shows, not Transformers? Beat me to the punch man, it looks a lot like a Zaku than any Transformer I've ever seen before. Yeah those news people should be ashame of themselve for not knowing Gundam! I respect the robot. I hope that this statue doesn't get destroyed for violating the laws of Islam. I respect the Zaku. If the amusement park it's promoting pays off, taxes collected from it will cover the creation of the statue (at some point). It needs a paint job, and if it was animated-> $$cha-ching!$$$. Tourist dollars! Get some spotlights aimed at that, quick. the Zaku is strong with this one, so ether you reported it wrong or Turkey can't tell the difference between a Transformer and a Mobile Suit. It is really funny to me that it matters to me SO much more that the article is calling them "transformer like" when the statue IS, in no exaggeration, exactly what a Zaku 1 Gundam looks like. The fact that a ton of Turkish tax money was spent on this is entirely lost on almost everyone who reads this and recognizes that whoever chose to site/reference the statue as "transformers like" is completely wrong. Given that this is a nerdy/geeky website, it astounds me that such a thing is so out of touch with the people reading it that it actually distracts the point of the news story completely. I can't get over how much more it bothers me that the statue was not recognized, than how some politic body wasted it's citizens tax money. XD THAT is a feat in and of itself. I was about to respect the robot, but then i read that it was Melih GÃ¶kÃ§ek who erected it. So no, nothing done by that lunatic deserves any sort of respect. Turkey has been known to get bent out of shape over the smallest of things. Respect the Robot. That's a Gundam god dammit. Do you even know what a transformer looks like. It looks like a bunch of Zaku models mixed together, probably more akin to Chinese Zaku knockoff. Seriously though... Transformer-esque? Off to the Geek Reeducation Camp with you! It's obviously a Zaku, whoever wrote this deserves a colony drop...Sieg Zeon .-. This is what happens when Japan starts building statues of giant robots: escalation. Now every country will have to start building giant robot statues. First one to make an actual giant robot wins. As funny as it seems to just build a giant robot statue. This is probably a severe case of government corruption. The mayor probably has a friend who "needed" some work, and this happened to work out as a convenient excuse, albeit a ridiculous one. Why does it look built as if it has a selfie-stick? That's the traffic signal attached to a pole behind it. Looks like the love child of a Zaku, and a Cylon. Robots are cool. Robutt wins. The snout and mohawk kinda lean towards cylon more than Zaku which were usually bald or had a commander's horn. Precisely what I thought. I made a be-line to the comments before reading the rest of the article to point that out. Intergalactic Planetary Planetary Intergalactic. Intergalactic Planetary Planetary Intergalactic. Intergalactic Planetary Planetary Intergalactic. Intergalactic Planetary Planetary Intergalactic. The...beastie boys? How have I forgotten this track until now?? You, sir, have stirred some ancient memories. I wouldnt expect The Independant to know its robots. Well the mayor just got a lot of respect for me. its about time we get some recognition for something thats been active in our culture for decades. Certainly beats the current modern art. if you can call placing a rusted pipe and calling it a fancy name art. Yep, apparently my town spent millions on a rusted pipe. theres an "All robots look the same" joke in there somewhere. Capcha: Accidentally on purpose. not sure how that works capcha. People always get upset about publicly paid for roadside artwork if it's not classicist. I don't even think that's entirely without merit, leave the minority tastes up to the private sector.